Launched through a Technology Alliance Partnership with nodeable software, Roundtable Dashboard is an extension to Roundtable TSMS, the best-of-breed Software Configuration Management solution for the Progress OpenEdge platform. Roundtable Dashboard provides detailed insight into the state and performance of applications developed under Roundtable TSMS as well as additional tools to design, manage, automate and continuously review work with tasks, workspaces, code, and more. Accessible through a web browser, tablet, or phone, Roundtable Dashboard will become a convenient single point of reference by which all stakeholders — technical and non-technical — can become aligned and have complete visibility across the entire application lifecycle. Roundtable Dashboard extends the powerful capabilities of Roundtable TSMS beyond software configuration management (SCM) to encompass application lifecycle management (ALM) and more. Features include the following. Roundtable Dashboard provides detailed graphs and statistics that make it possible to see the status of the application development cycle, workload, bottlenecks, and more. Business users and managers can measure activity, performance, costs, productivity, and efficiency levels and use that information for future planning and strategy development. Roundtable Dashboard takes task management capabilities already available in Roundtable TSMS to a whole new level with the ability to also manage priorities, assignments, labels, milestones, comments, worklogs and workflow stages. Future releases will also include integration with more external issue providers, code reviews, CI/CD, and DevOps. 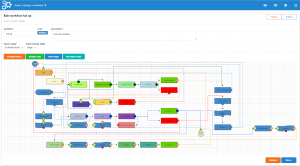 Roundtable Dashboard includes the beginnings of an advanced integrated workflow system, which will allow end users to design and implement workflows to focus and streamline the movement of changes throughout the application lifecycle. This will help eliminate common problems with existing manual processes. The integrated workflows will also enable customers to embark on a journey to modern DevOps and CI/CD with their Progress OpenEdge application development. This solution is evolving quickly. Join our Roundtable Dashboard mailing list to stay informed of new developments and of opportunities to participate. There’s more depth to this solution than shown. Ask us for details. We can help you determine if Roundtable Dashboard is right for your group. We had a need. nodeable had the expertise. Learn how we connected to launch the Roundtable Dashboard via the Strategic Partner Program. This product has been developed exclusively for Roundtable TSMS by Technology Alliance Partner nodeable software. To see a complete list of product features for Roundtable Dashboard, visit the nodeable Roundtable Dashboard product page.